"The Cappannelli’s are the real deal. Their coaching with individuals and world class organizations gets to the heart of the matter." "George and Sedena remind us that our fear of changes, like the fear of so many things,blocks our ability to experience and express love, which is really our natural inheritance." In this complex world it is not a question of if you will change, but how. 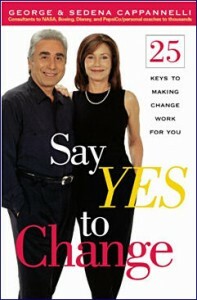 In Make Change Your Ally, George and Sedena Cappannelli, two of the country’s leading individual and organizational coaches, and authors of Say Yes To Change, Authenticity and Do Not Go Gently, assist you turn change in an ally rather than an adversary. This program will allow you to use the changes that occur in your life as doorways to new learning, new opportunity and new levels of personal satisfaction and professional success.